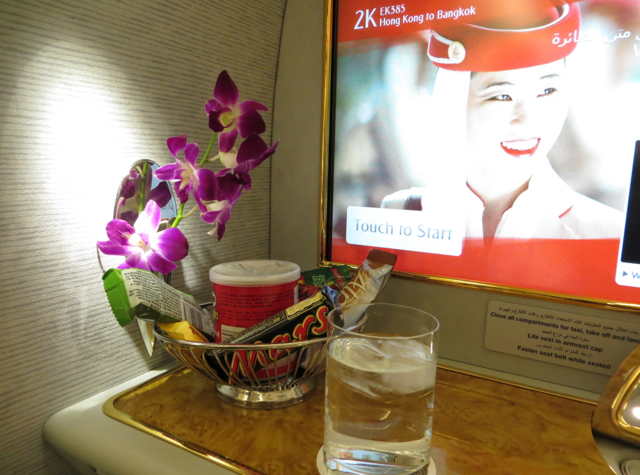 As I noted in Emirates First Class Award Fifth Freedom Bangkok to Hong Kong Flight?, Emirates' Hong Kong to Bangkok flight is a feeder flight for its Bangkok to Dubai route. It's still pretty amazing to be able to fly international first class on such a short flight (3 hours or less, depending on which direction you're flying) much less take a shower in the sky. 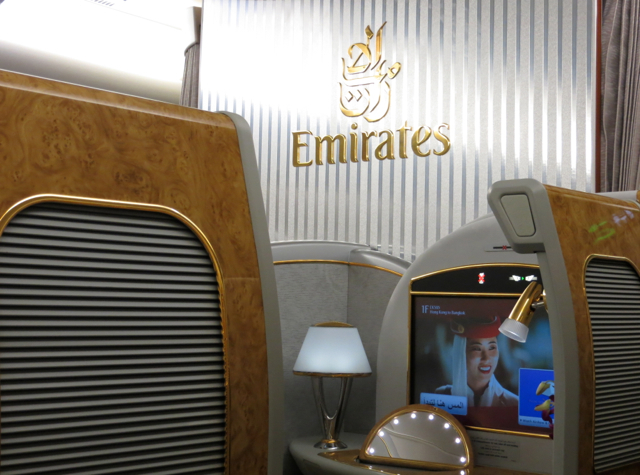 I was looking forward to trying Emirates First Class and comparing it to the three Singapore Suites flights I'd just flown, as well as Etihad First Class, by way of another Gulf carrier. 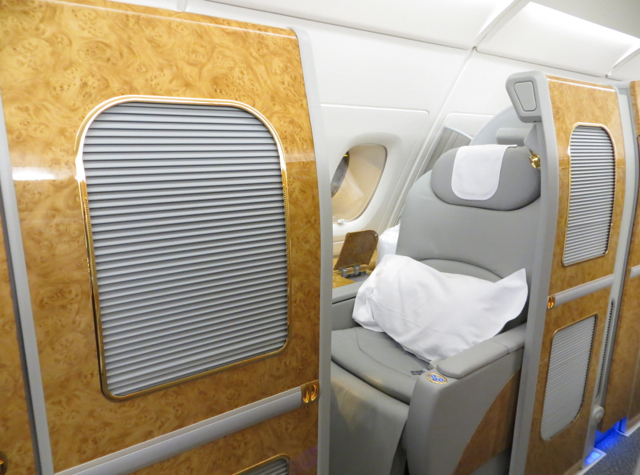 Note that if you're only on Emirates First Class between Hong Kong and Bangkok, there's no Emirates Chauffeur service; there is if you're continuing on (or coming from) Dubai. 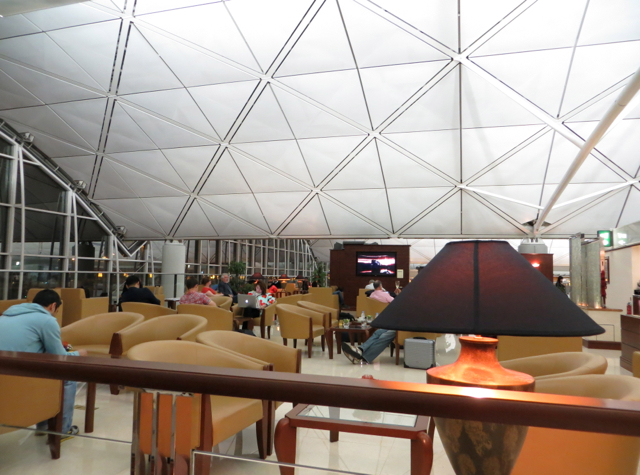 The Emirates Lounge in Hong Kong, for Emirates First Class and Business Class passengers, is a rather underwhelming ground experience as international lounges go, with just a wide open seating area, no sleeping rooms or reclining chairs, a business center, and a very small bathroom with one shower stall (at least for women–assume it's similar for the men's bathroom as well). 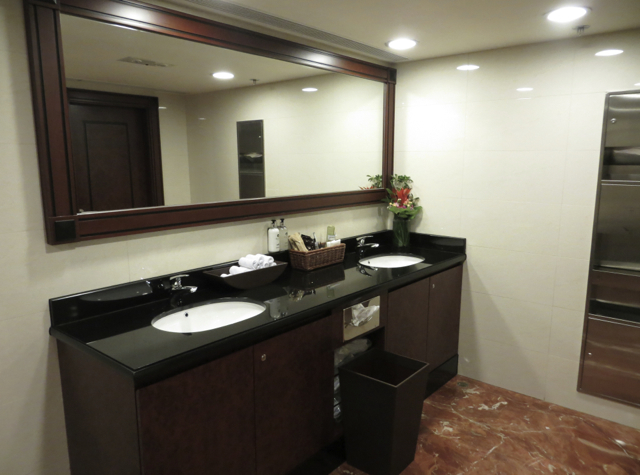 I was surprised that, given how the size of the lounge and how crowded it was, that the bathroom was so small and with only one shower stall (occupied during the entire time I was there, so it wasn't possible to take photos). 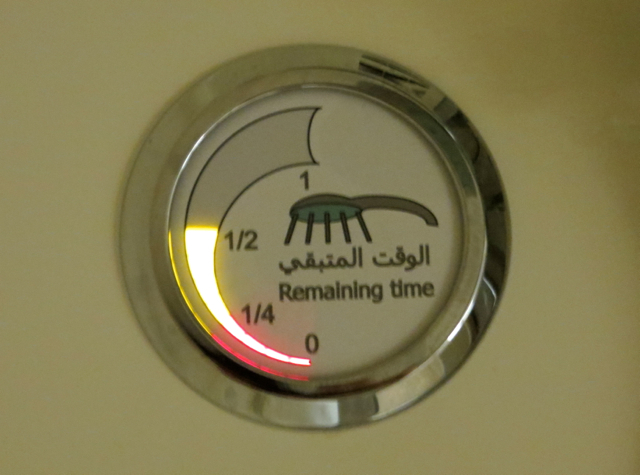 Emirates Business Class passengers don't have access to an onboard shower, so the lounge really ought to have more than one shower. 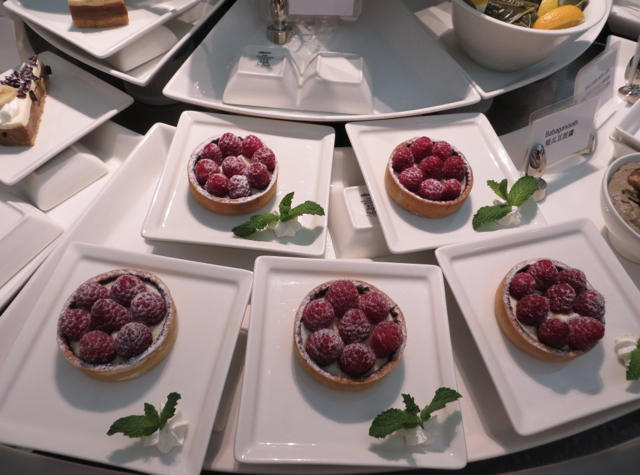 The one area it did seem quite decent at was for cold appetizers, mezze and desserts. 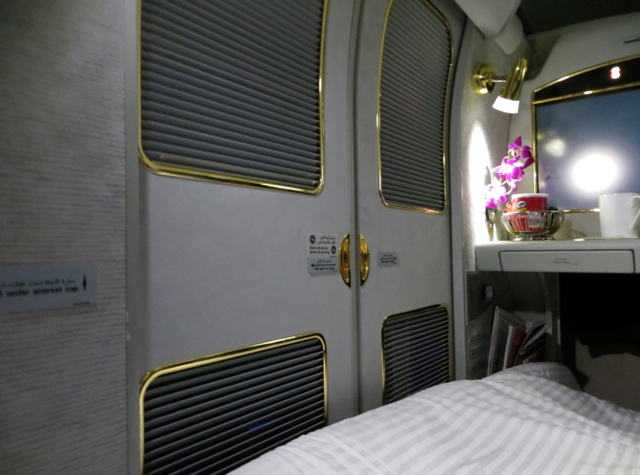 I knew from the photos that Emirates' cabin is all about bling, but wow–I couldn't help but think a Russian oligarch couldn't have put together a more gaudy looking first class if he tried, with all the gold and Hollywood lights everywhere. My suite, 2K, was a right window seat. In its full upright position, for takeoff, it was not all that comfortable. 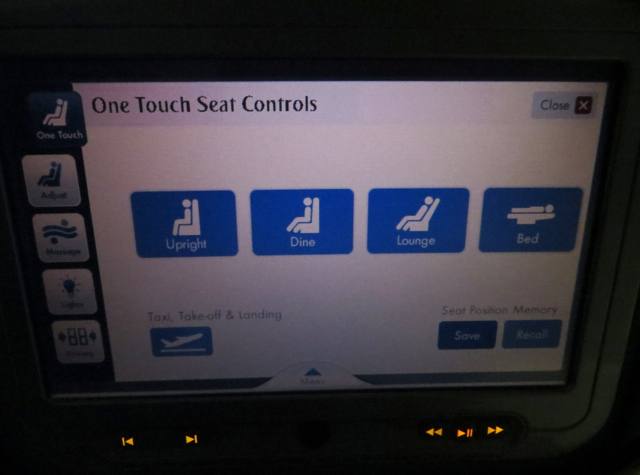 I was relieved when I was finally able to recline it after takeoff. 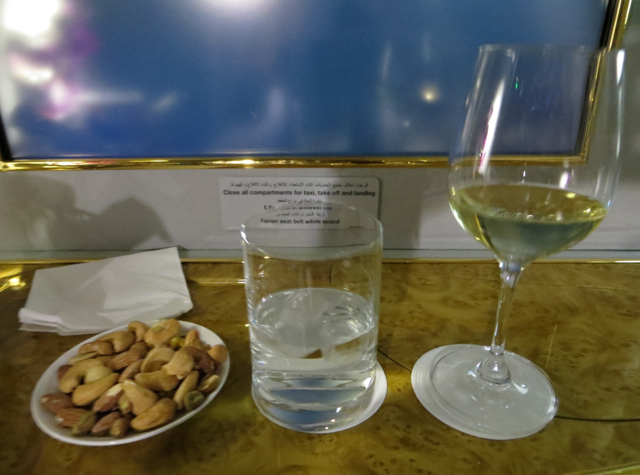 Prior to takeoff I was served a welcome drink (my usual water) and a curious basket of “goodies”–candy bars, Pringle potato chips and such–was placed alongside, and provided again after takeoff. Again, it reminded me of Russia a couple decades ago, when branded candy bars such as Mars bars were really cool. 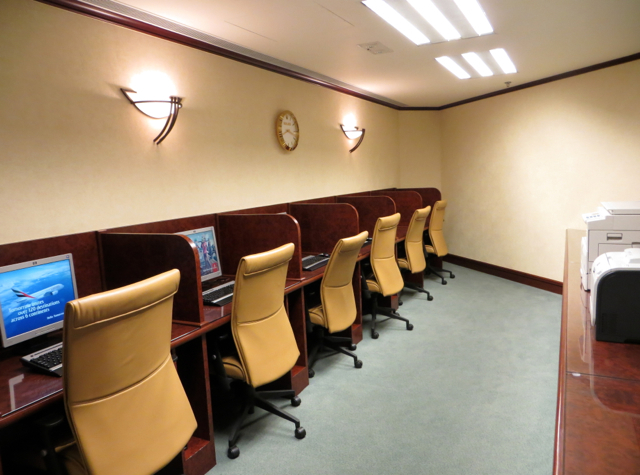 It would certainly make any kid or kid at heart happy, but it seemed strange in what is supposed to be a luxurious first class setting. 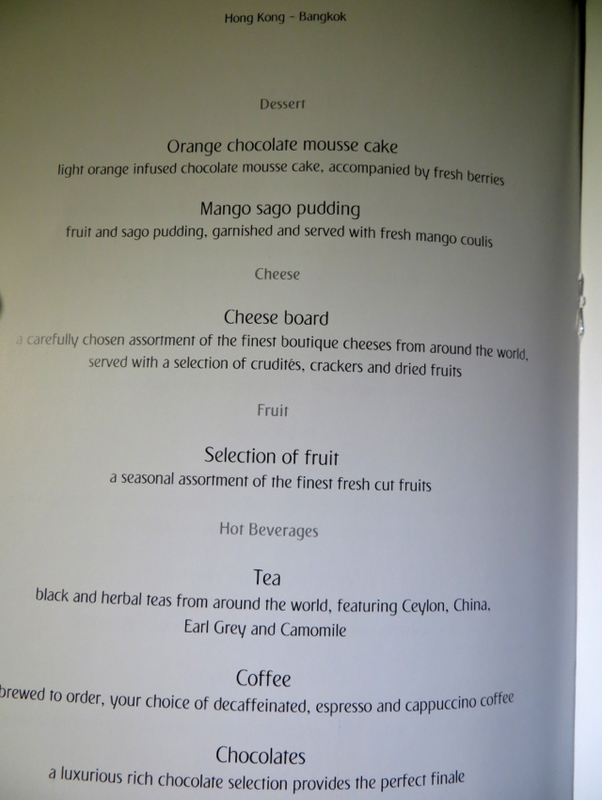 As with Etihad First Class, a nice Middle Eastern hospitality touch was to serve a plump date along with Arabian coffee. 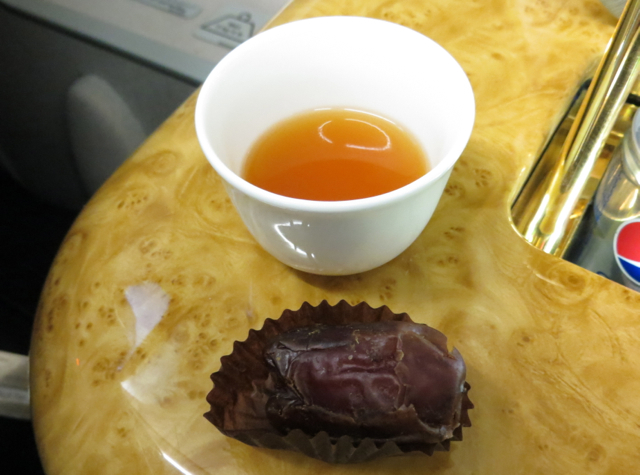 I liked the date, although the Arabian coffee seemed rather watery and only lukewarm. 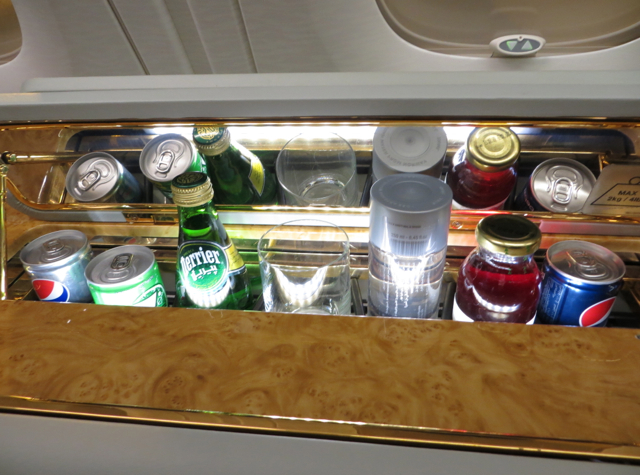 There's a mini bar, although I've never really understood the attraction of a mini bar unless it's kept cool, and to my knowledge none of them are, on Emirates or any other first class suite with a mini bar. Before takeoff, I mentioned I would like to take a shower before the meal, and this was graciously agreed to. 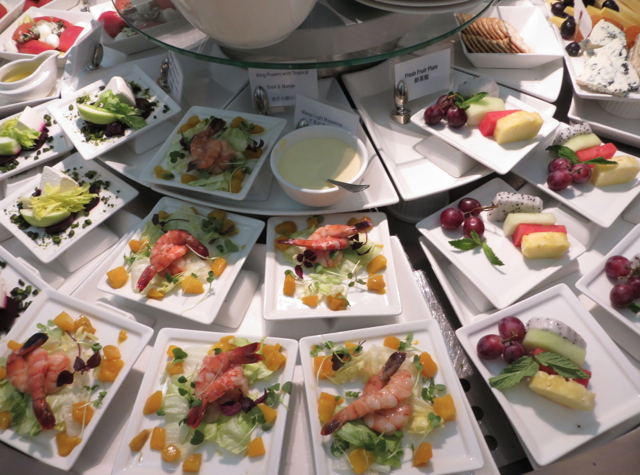 There seemed to be some communication breakdown, however, since after takeoff, the other flight attendant working the first class cabin seemed genuinely surprised that I wanted to take my shower before the meal, rather than after the meal. Fortunately, since there were only 3 other passengers in First Class, one of whom slept the entire way, it was no problem to switch it, and I was soon able to take my shower. On entering the bathroom, I found there weren't any slippers, so I asked for some. There again seemed to be some surprise, as the attendant hurried away to find some, but finally slippers were brought. 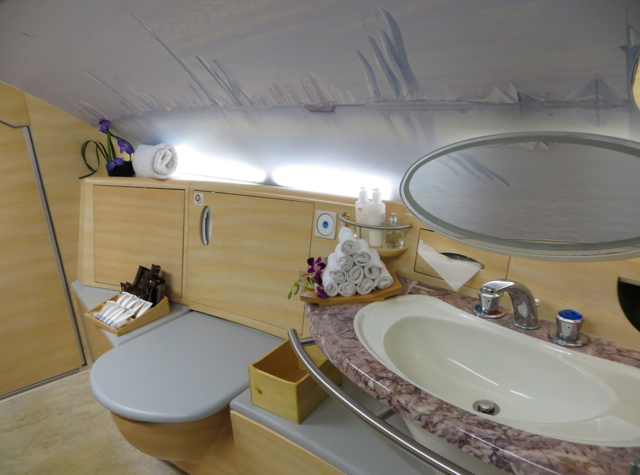 It's impressive to have such a nice sized bathroom on an airplane, so from that perspective as well it's a real highlight. 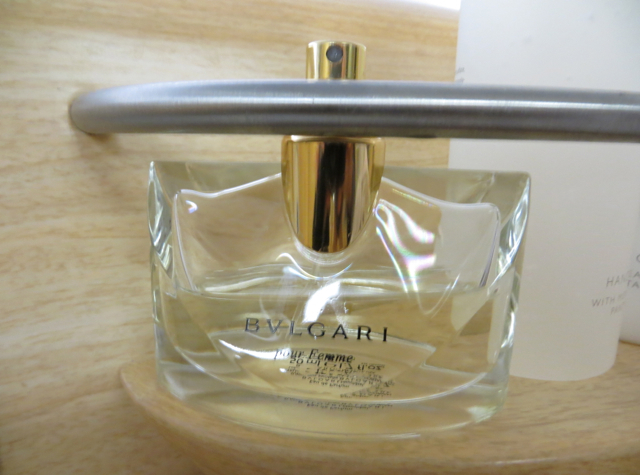 In addition to the shower, there's a washbasin, toilet, bath amenities, hanger for your clothes, and Bulgari perfume. You are given 25 minutes in the bathroom, and 5 minutes of water for your shower. Conveniently, there's a “Time Remaining” indicator for how much water you have left. As I usually take short showers anyway, I had no problem staying within my allotted 5 minutes. 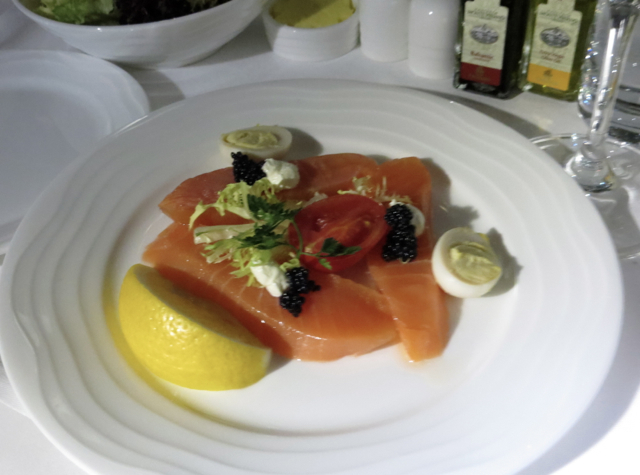 I started with the Loch Fyne Scottish salmon appetizer with caviar and quails' eggs. 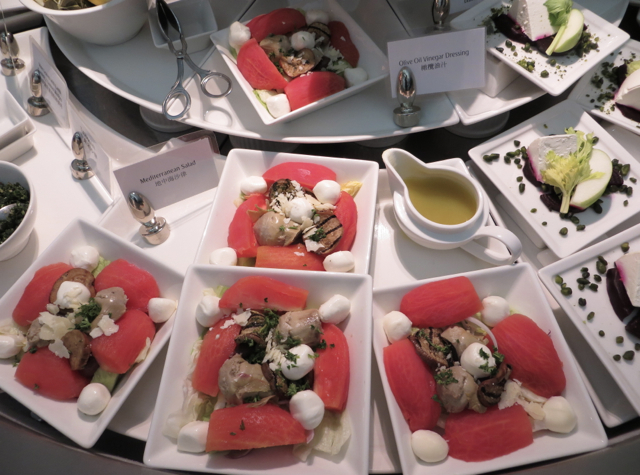 While I still prefer the Balik salmon served in Cathay Pacific First Class, this was a delicious appetizer. 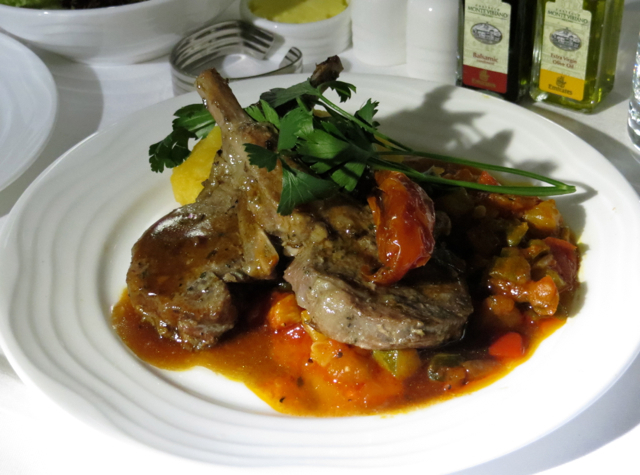 As I was quite hungry, I chose the Grilled Lamb Rack with Ratatouille as my entree. 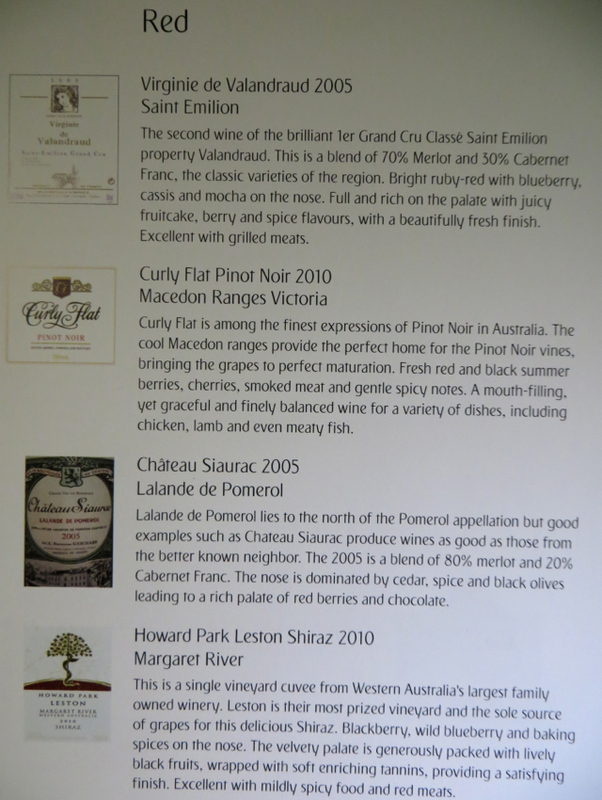 I was surprised by just how good it was-perfectly cooked, and well accompanied by the fresh tasting ratatouille. 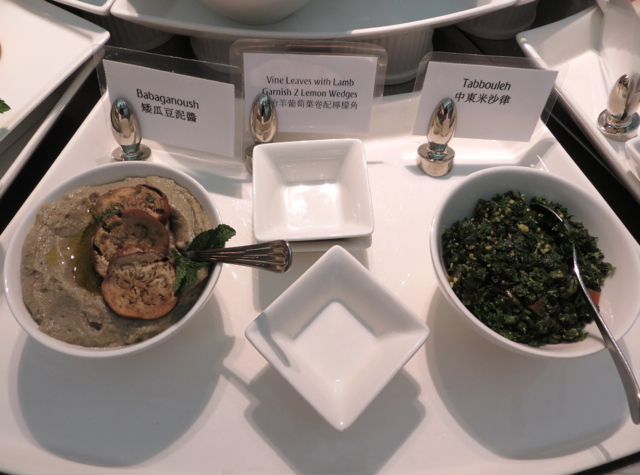 Perhaps my expectations were lowered by the cheesy candy bar snack basket, but at least the savory items I sampled on Emirates were excellent. Dessert, after the strong main course and appetizer, was a let down. 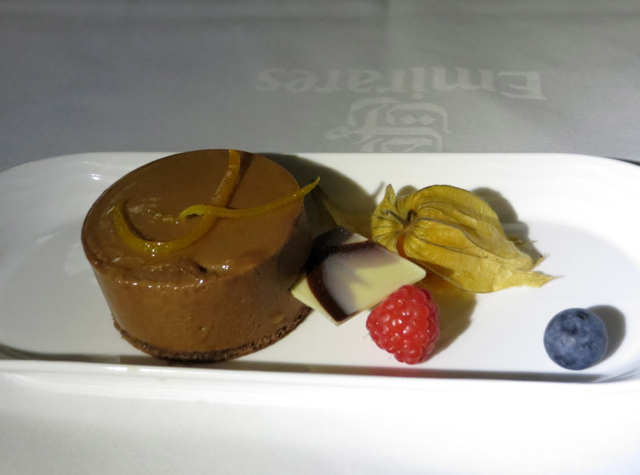 Plating and presentation were fine, but the orange chocolate mousse cake could have come from a third rate bakery, and I took a couple bites before leaving it. 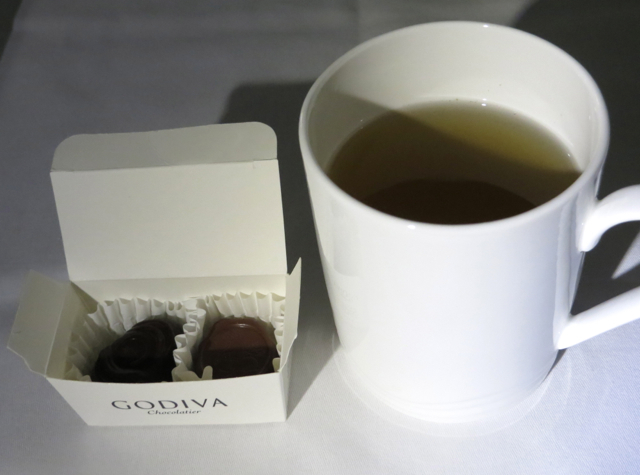 I finished with peppermint tea, and it was accompanied by Godiva chocolates. I don't consider Godiva chocolates to be any good, so passed on those. When serving chocolates, or as the airlines often list them, “pralines,” I just wish they would provide high quality ones, say from Pierre Herme or Michel Cluziel. 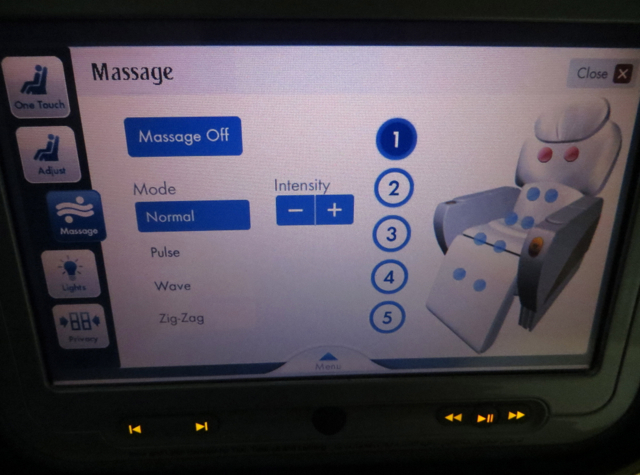 My favorite option on the touchscreen was the massage function–it actually worked well, unlike other chairs, such as SWISS business class, which ostensibly have a massage function but you can barely feel it. The flight attendant was surprised when toward the end of the flight I asked for turndown service, but she obliged, so I got to see how the bed felt. Because Emirates doesn't offer an ottoman (there's no option to dine at the same table with your travel companion, as there is for most other first class products) the end of the bed is not flat. I found it rather uncomfortable that the end of the bed was so slanted, although others might not mind as much. 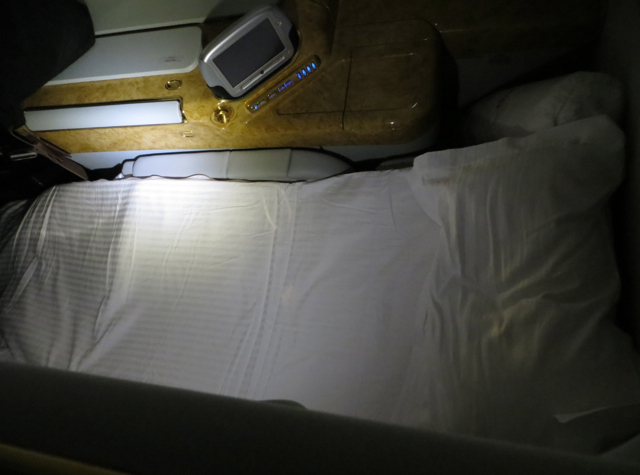 And even with the bedding, the bed overall was not as padded or comfortable as Cathay Pacific, let alone Singapore Suites. 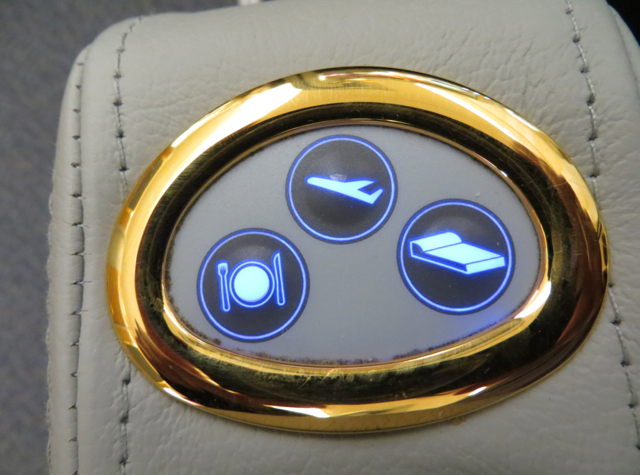 Emirates' First Class Suite doors close via touch screen controls, unlike the manually closing suite doors in Singapore Suites, Etihad First Class and Asiana First Class. That automation can be cool if it reliably works, but in my experience there's less that can go wrong with simple manually operated sliding doors. 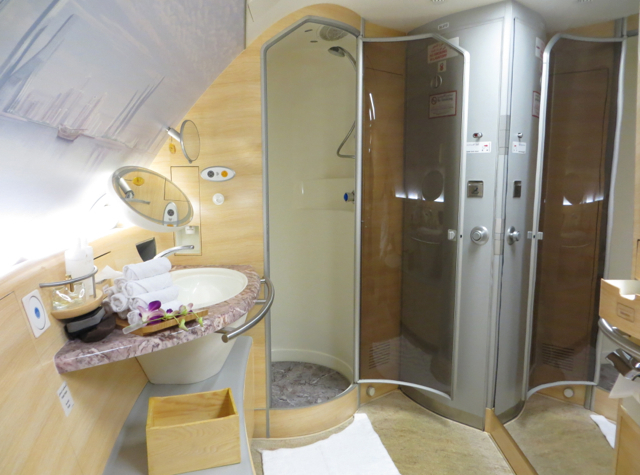 Verdict: There's no question Emirates' first class shower is a refreshing perk and draw, as it should be–it's the only on-board shower on a commercial aircraft. 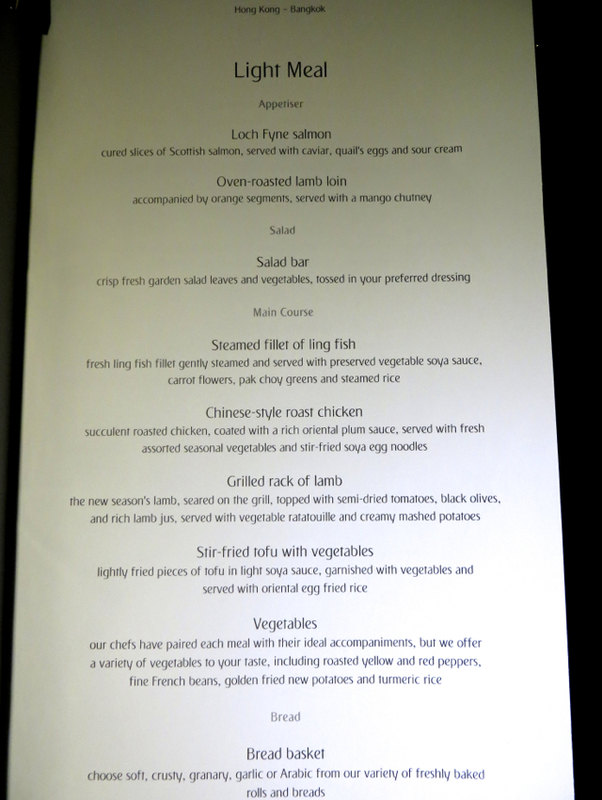 That and the dinner entree were the highlights of my Emirates experience. 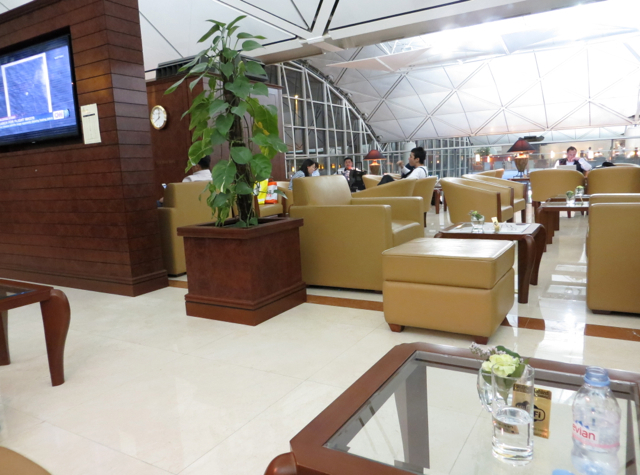 I was rather disappointed by the seat and the “flat” bed, however–I didn't find it very comfortable, especially compared to other first class products such as Singapore Suites, Cathay First Class and Etihad First Class. 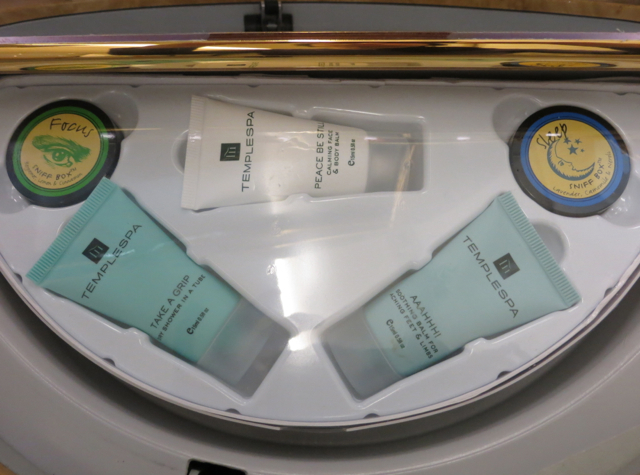 I also didn't find the service to be anywhere near the level of Singapore Suites, Cathay Pacific First Class or Asiana First Class, and it was also not as good as my prior Etihad First Class flight. That said, this was a single short flight, so I'll have to see how service fares on a longer Emirates First Class flight. Certainly if the route made sense I would fly Emirates again, but I wouldn't look forward to it as much as some other carriers. 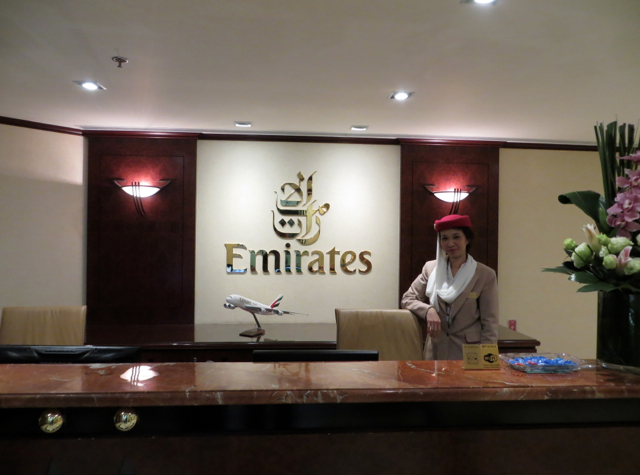 Emirates First Class Award Fifth Freedom Bangkok to Hong Kong Flight? 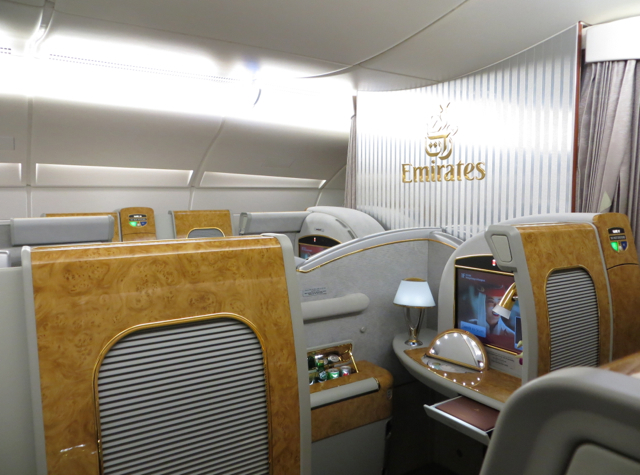 Emirates: New AMEX Membership Rewards Transfer Partner Worth It?